This is what we do at Torley Precision Machining. At Torley Precision Machining, we don't just work for our clients, we work alongside them, through the details, the unyielding deadlines, and the inevitable changes; we've been forming these partnerships since 1966. 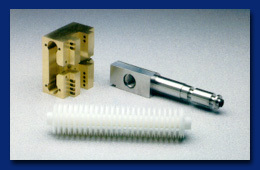 Though Torley Precision Machining's work today spans a broad arena, our past experience in the defense and aerospace industries has resulted in the high level of perfection required of a company whose parts could be found on every Apollo spacecraft, as well as on each of the NASA Space Shuttles of the 1980s.